This was one of the youngest kudus we've seen this season. It's cool and cloudy again today. The morning couldn't have started out better. Unusual for a weekend morning when there are often loads of short-term tourists in the park, we were pleasantly surprised to find a steady stream of wildlife visitors, including a band of mongooses who totally entertained us which precipitated these three included video, each uniquely different! The neighbors next door are here for the weekend and obviously, have something delicious they are feeding the animals since the animals have been going back and forth between our two houses. They'll all stay there for 15 to 20 minutes and then, when bored, return to us. They stayed close to one another except during the egg eating frenzy. They are definitely opportunists possessing a bit of flair in their methodology of procuring their next meal. In any case, we're the recipients of the resulting pleasure of their somewhat obsessive meandering between the bush homes. We love every moment, every adorable face, every tongue swiping across their lips in anticipation of the next tender morsel. Whether they love us, like us or feel any emotion toward us is difficult to determine. We can't help but equate their responses to those similar to dogs we had and loved over the years. In time, they grow to recognize us, respond to us and exhibit often human-like responses to our own obsessive attention to everything they do, each time they gaze into our eyes, each time they exhibit an animated response. Sure, these visiting animals are not domesticated, such as dogs, but that doesn't negate their ability and seeming interest in who we are as well as what we have in the way of sustenance. Mongooses trying to crack eggs. There are many schools of thought on this theory. Do animals really know and love us or are they simply responding to instinct and a desire for food, comfort, and safety? Here's a link to a website that presents an interesting debate on this topic. Bottom line, we each can choose to believe what is most logical to our needs and emotions. I choose to believe the more intelligent animals on the planet have the innate ability to communicate with us which has been proven over and over again in many laboratory settings. Feeding mongoose eggs in a bowl. Over this past year of spending 12 to 15 hours a day, most days, observing their behavior I'm hard pressed to believe it's all about instinct. But, as humans, we ultimately have the innate ability to choose what we believe and we may not all agree. And perhaps, our instincts as humans may be no different than that of animals. Everything we do, everything we feel, everything we think and everything to which we respond is based on one sort of motive or another. Do you agree with that? These thoughts were precipitated by an interesting conversation we had last night at Jabula Lodge and Restaurant with dear friends Lynne and Mick, the first couple we met in Marloth Park, five years ago, ironically at Jabula. 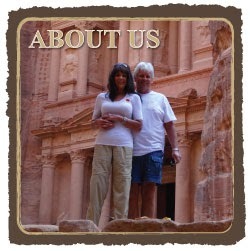 We had a delightful evening with this well-traveled and fascinating couple and so appreciate them hosting the evening. It was our last time together for a few years, as they too will soon be heading on another adventure in Africa. Undoubtedly, we'll continue to stay in touch until we return to Marloth Park in March 2021. Besides, Lynne and Mick are true birding experts and often assist me in identifying birds in the bird photos we post. Mongoose eats a rib bone. We continue to revel in all the wonderful friends we've made here over the years and hope our mutual travels will bring us together at other locations throughout the world. And, of course, we continue to revel in all the amazing wildlife friends we've made along the way. The big question remains...if we're fortunate enough to rent this same holiday home in 2021, will they remember us? We'll let you know. This is unreal...the Black Browed Albatross on Steeple Jason Island, remove tall grass from these massive "pod-like" structures, adding mud and vegetation to make it a freestanding pod on which they can nest. Here's a young chick making a little noise while atop her/his elevated nest. That's amazing! Please click here for more photos.